Betelgeuse is the brightest star in the constellation of Orion. It is a, so called, red giant, and lies at a distance of approximately 657 light-years from the Earth. It is one of the largest known stars and has a size as big as the orbit (!) of Jupiter. 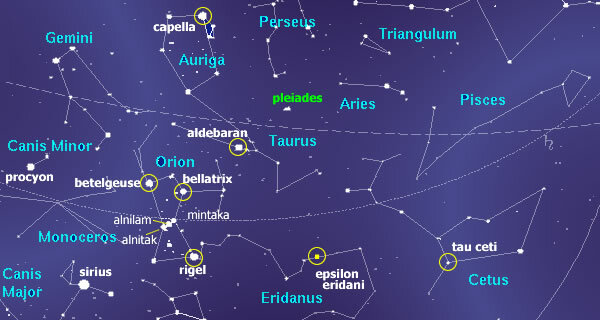 In the constellation of Orion, Betelgeuse can be located as the left shoulder of the Hunter, in the Northern hemisphere. Betelgeuse is said to be, or at least to have been, the home of the Council of Light (or Orion Council ?) and the Forces of Light during the Orion Wars. According to some sources, it still is the home of the Council of Light. Other sources, however, including Bill Cooper, mention Betelgeuse as the home of the Large Nosed (Tall) Greys, called the Eban. The (negative) Zetas are said to have bases / colonies in the Betelgeuse system, too. This topic was copied from theHyperBase and is likely to be revised.